Today we left Salt Lake City Utah for Mesquite Nevada, a total travel time of a little over 7 hours. 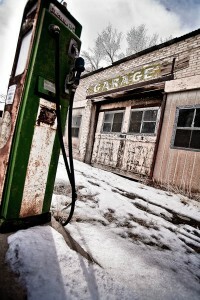 We stopped in Scipio Utah on the advice of a photographer friend who told Darlene about a garage with antique gas pumps. While Dar took photos, Rob found an antique store and bought a Compound bow. After filling up the tanks in Beaver Utah, we were pleased to find a 20% fuel efficiency improvement after adding the Quantum Energy magnets. After gassing up and moving the quantum energy magnets from the Toad to the motorhome engine, we left for Salt Lake City Utah. 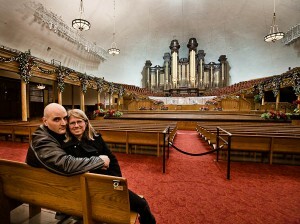 It was a short day on the road and we were both excited about visiting the Mormon Tabernacle and Temple Square. As it was the holiday season, the Temple Square was lit up and filled with families. Dar got some great shots while Rob crossed another “point of interest” off his list. Another very high stress day for Darlene after a day of driving through Idaho and Montana in the RV. As Rob began to level the motorhome for the night, the leveling jacks slipped on the snow and ice throwing the coach backward. It looked as though the jacks were broken, but while Dar’s emotions got the best of her, Rob simply put the jacks back up and began again. Then more cat pee. 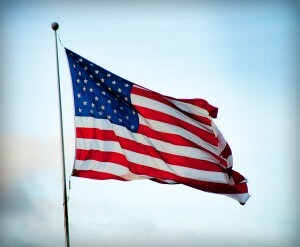 Crossing the border in an RV has been playing on our minds for months. Research and phone calls to the Montana port of entry educated us about things such as cat food ingredients and the amount of wine we could cross the border with. First though, we had to smuggle the cats out of the hotel. 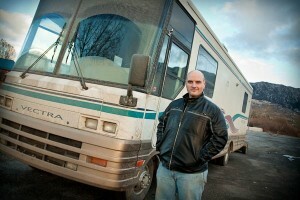 Our first day in the RV taught us a lot of lessons. 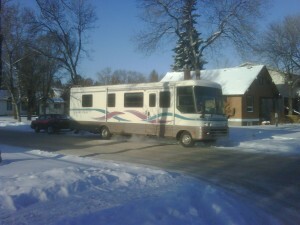 Leaving Canada for an 18,000 Km motorhome vacation through the US in -26 degree weather will do that. It was a hell of a day right from start to finish.